New firmware v1.08 beta 03 and Windows client GUI v1.06.08 available! Please check release notes for RF Explorer firmware here. Firmware and PC Client are available for free in our download page. Simple instructions to upgrade firmware are available in this article. Please check release notes for Windows GUI here. Among other things, the GUI can now display WiFi channels on screen and also run in Tablet PC with reduced screen resolution. The screen is now resizable to make better use of your screen. There is also a new "dark mode" skin available for those fans of black screen instrument modes. This new firmware includes lot of new things, like manual marker mode, support for extended 2.4GHz band from 2350 to 2550Mhz, and also fixes required to properly work in the MacOS client version Dirk-WIllem van Gulik made available here - Please check Release Notes for more info. 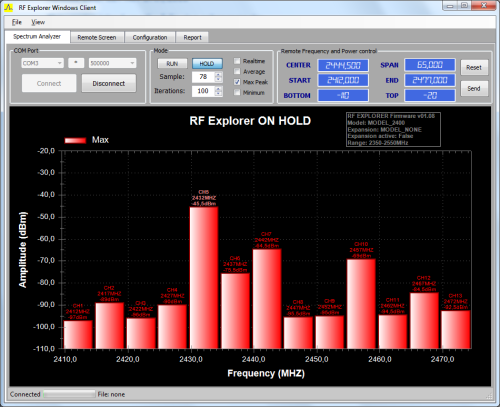 RF Explorer has now a working version for Mac OS, thanks to the great job done by Dirk-Willem van Gulik. Kudos for a nice looking tool! Note this is a work in progress and you will need to upgrade to firmware v1.08 Beta 02 to use this as the current RF Explorer firmware v1.07 available doesn't properly handle baudrates accepted by MacOS Silabs driver. This issue has been fixed in firmware version v1.08 Beta 2 (and newer). 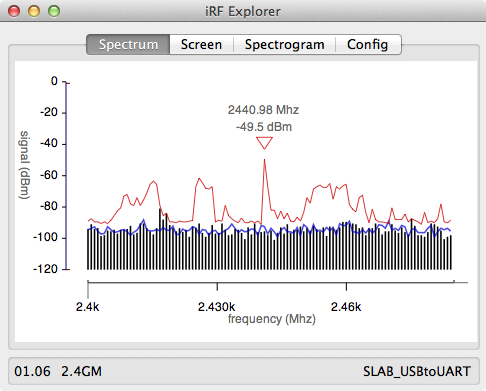 Issue: RF Explorer doesn't honor the 2400bps low connection speed for Spectrum Analyzer mode, only 500Kb high speed works. Description: If you select the 2.4Kbps speed in the CONFIG MENU in RF Explorer, it will internally ignore the baud speed setting and will keep working at 500Kbps. Additionally, you need to select 500Kbps in all cases in the Windows PC Client for the USB connection to work. You can get more info in this thread. Thanks to user dirkx for catching and reporting this. Readers may also be interested in his thread if want to connect RF Explorer to MacOS and/or Linux. Versions affected: Firmware versions v1.06 and v1.07. Note the bootloader is not affected by this bug, it works in both 500Kb and 2400bps modes. Fix priority: A fix will be released in an upcoming v1.08 beta 02, together with additional features and enhancements. If you are affected by this and cannot wait for upcoming beta please contact us to find a way to temporarily fix this for you. This new version improves the GUI for the Remote Screen tab. It uses an advanced control with double buffer to avoid flickering. Available at the download page.